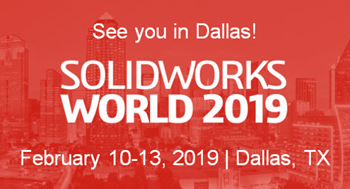 SOLIDWORKS World 2019 in Dallas will be DriveWorks’ 16th year at SOLIDWORKS World! The event takes place from 10th – 13th February 2019 at the Kay Bailey Hutchison Convention Centre. We’re excited to be a part of the action again – sponsoring, exhibiting, presenting, listening and learning. We’ll keep you updated with details of our design automation presentations as we get closer to the event. If you’ll be there, you’ll find our team on booth #411 in the Partner Pavilion! At SOLIDWORKS World 2018, we introduced the DriveWorks CPQ Template! The DriveWorks CPQ Template is a series of DriveWorks projects and templates that when combined, create a powerful CPQ solution. It’s a starting point for any DriveWorks customer and can be used as a complete CPQ solution or taken apart to use individual features and functionality. We also told attendees about the DriveWorksXpress Training and Certification program. Design automation is becoming the norm and engineering professionals and students can gain the skills they need by completing the DriveWorksXpress Training & Certification. In this video, Maria Sarkar, VP and Co-founder of DriveWorks, talks to TriMech about our technology and the DriveWorksXpress Training and Certification. We were also presented with the SWUGN Co-Participating Partner of The Year Award, alongside Rapid, at SOLIDWORKS World 2018. The awards have been around since 2005 and this was the first time it’s ever been a tie! We were so honoured and proud to receive this award! With the support of our resellers, customers and partners, we have attended SWUG meetings, sponsored meetings and helped group leaders to find presenters with interesting presentations since 2015. Here’s Heather Hasz, who is involved in running the SWUGN sponsorship program here at DriveWorks, talking to TriMech about our award.